Have a Worcester-Bosch or a Vaillant condensing combination boiler supplied and fitted from only £1,150 (subject to site survey). Get in touch now for further information! We're confident that we can beat any genuine written quotation - give us a try. If your existing boiler is more than 15 years old, replacing it with a high efficiency boiler could save you as much as 35p in every £1 on the gas used for heating and hot water. For an average family spending £1000 per year on gas and electricity, that's a saving of around £170. 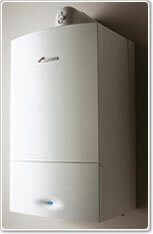 Most new types of boiler can be categorised as high efficiency or 'condensing' boilers. 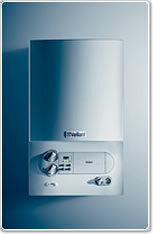 There are also high efficiency combination boilers, system boilers or traditional open vent boilers. By recovering and using heat that would otherwise be lost up the flue, the best high efficiency boilers can operate with seasonal efficiencies in excess of 90%. Although high efficiency boilers require a higher initial investment, they are very economical, and can repay the extra initial cost in fuel savings.